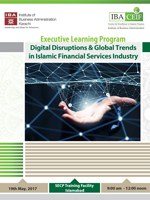 IBA Centre for Excellence in Islamic Finance is pleased to offer a half day workshop on Financial Technology Disruption in the ­financial services industry. The session will be focused around how Fintech (Financial Technology) disruption is impacting the overall business model of the fi­nancial services industry in recent times. This course will enable participants to gain valuable insights into how global establishments are taking bold steps in embracing emerging innovations. Mr. Ashar Nazim leads EYs Global Islamic Banking Center of Excellence. He has more than 20 years of experience in the Islamic Finance industry. He brings a unique track record of corporate fi­nance, strategy consulting, regulatory and industry roles that gives him a holistic understanding of influences driving change.